PRO_VLIM is a program which allows to analyze and perform safety checks of reinforced concrete cross sections subjected to biaxial bending and axial actions. 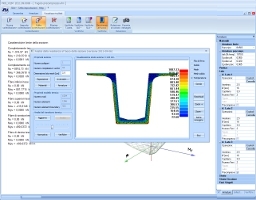 The program allows to study any kind of cross section shape. The program also allows to consider both prestressed and nonprestressed concrete. Moreover it’s possible to consider FRP reinforcements. PRO_VLIM also performs analytical fire bearing capacity analysis. The study of interaction diagram for the cross section (Mxu, Myu, Nu surface). For an easier reading of results, it’s represented with curves with constant axial action or constant bending moments ratio. The study of how a cross section comes to a limit state (actions increase). The study is performed with the usual modalities: constant axial action, constant bending moment or proportional. Serviceability limit states safety checks. Analytical fire bearing capacity analysis. Safety checks with the allowable stresses method. Autonomous, for a quick check of a cross section. Connected with PRO_SAP for safety checks of structural elements of a FEM model. Even if PRO_VLIM can run separately from PRO_SAP, fire bearing capacity analysis requires PRO_SAP’s modulus 8. Safety checks of cross sections reinforced with FRP requires PRO_SAP’s modulus 10.